There’s no doubt that a leading reasonreplacement windows can save you money is the upgrade in energy efficiency they’ll give your home. According to the Window and Door Manufacturer’s Association, windows 20 years or older can produce as much as 5.3 tons greater greenhouses gases annually that new windows. New windows seal out drafts and temperature extremes in winter. And thanks to high tech coatings, new windows can repel unwanted solar heat in the summer months, reducing air conditioning demands and extending the savings year ’round. Of course if your windows were stuck closed, replacement windows that open with ease let you take advantage of cool breezes – another way to reducing your cooling costs. The same coatings the keep out the sun’s heat also block harmful UV rays, which can allow you to keep the curtains and upholstered furniture you invested in longer by reducing sun fading. According to Remodeling Magazine’s Cost vs Value analysis in 2010-2011, the investment in wood windows is returned approximately 67% and 72% when selling your home. While you may not be planning to sell, this factor can possibly influence the appraisal of your home as well. If you read the fine print, many older wood windows require constant repainting to prevent deterioration and rot. New windows have improved finishes and advanced materials such as fiberglass or high quality aluminum cladding that may never need to be painted again to stay looking like new. When you replace windows, you gain security – a savings that’s hard to express in dollars alone. Improvements such as double panes and tempered glass can prevent intruders from knocking in old glass. Strong-as-steel fiberglass may prevent burglars from forcing open a dilapidated frames. Plus, there may be improvements to fire codes that specify better egress – the amount a window needs to open to provide a safe escape route in the event your doors are blocked by fire. 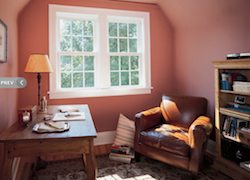 When ordering new windows, your retailer can help with expert advice.